Tennessee River MM357.4 just downriver from the George S. Houston Highway Bridge. When traveling downstream, turn right at the first green buoy below the bridge and follow channel markers to the marina. 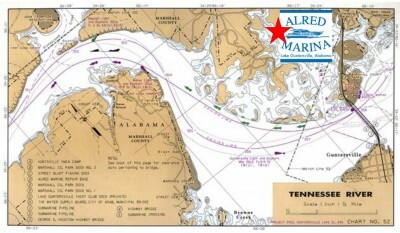 When traveling upstream, turn left after the last island before the bridge and follow channel markers to the marina (see Lush Creek on river chart). This is the river chart for our location. Courtesy USACE, Nashville District.